Aficionados of Steamworks Brewing Co.’s “high minded” brew, Third Eye Pale Ale (PA), now can “seek enlightenment” in a can — a 12-oz. aluminum can. 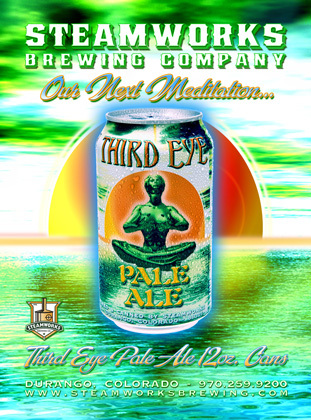 The Third Eye PA is now being offered for off-premise sales in six pack cans, in addition to the 12-oz. bottle six packs. The Third Eye PA, with its “spiritual” logo featuring a Third Eye PA patron in meditation, has emerged as one of Steamworks’ most popular beers, both throughout Colorado and with the brewery’s additional distribution networks. It is the second Steamworks beer to be packaged in a can, and will stand alongside its internationally-renowned brother, Steam Engine Lager. A complicated design, the Third Eye artwork required Steamworks to employ a new process for the cans’ production – called Iris – which allows for more colors to be transferred on to the can. Advance press checks were required before the run of more than 300,000 cans was launched. Initially the Third Eye in cans will be available throughout Colorado, Texas and Virginia. Third Eye PA is reminiscent of the English ales that date back to the early 1800s and, in Steamworks’ extensive beer repertoire, is one of the most heavily hopped beers. The larger grain bill does, however, produce a residual sweetness, and the Third Eye PA features an appealing light, copper color.